So, what’s in Endurant turf colorant? How does Endurant provide the most natural looking green grass color? How does Endurant come in varieties of green grass shades that match the most popular turfgrass species so perfectly? The secret is in the ingredients. Of course, we have to keep some details away from our competitors. However, we want to Endurant ingredients revealed to our customers because we’re proud of what we’ve created. Endurant turf colorants are specially formulated for use on turfgrass by combining organic pigments, surfactants and binders. These Endurant ingredients, combined with a water base, do not wash away once Endurant is completely dry. Dry time is about one to two hours. Endurant ingredients are selected to create a superior combination resulting in the best turf colorant available. Organic pigments are one of the reasons to reveal Endurant ingredients to the public. Geoponics, the maker of Endurant turf colorants, is proud to use organic pigments that are highly concentrated for the most natural green grass look. Endurant’s organic pigments are of the highest quality and come in a variety to match the most popular turfgrass species. Endurant’s organic pigments are what separate Endurant turf colorants from the other brands as these pigments provide a natural look. The less expensive pigments used by other common brands cause an unnatural look to the grass. Other brands often have a blue tint or fade to blue over time. Endurant fades on tone due to high quality, organic pigments selected specifically for turfgrass. The optimal ratio of colored pigments in Endurant allow for the variety of grass color options provided and the optimal tone from the time Endurant is applied through to fading. While fading will occur with all colorant brands, Endurant is the only brand that fades on tone, maintaining a natural look from day one through day 101. The combination of yellow and blue pigments that make up Endurant’s variety of greens are combined at the optimal ratio for even coverage, tone and fading over time. Endurant gets its name because of the highest quality binders. Endurant’s binders are long lasting and enduring. They are literally what keeps the colorant on the grass blades. The high quality binders provide the best possible combination of keeping the colorant on the grass blade, able to penetrate turfgrass’s waxy surface, while also allowing exchange on the surface of the grass. The ideal binder seals the colorant on the blade, penetrates the surface and yet also allows healthy oxygen, light and heat exchange on the surface of each turfgrass blade. Endurant has found the optimal binders for lasting green and healthy turf. The surfactants used in Endurant provide the even coverage necessary to allow the colorant to smoothly cover each grass blade from tip to dirt. The surfactants’ quality determines whether colorant will pool in spots or drip all the way down into the dirt or just stay on the tips of the grass blades. Endurant turf colorants are made with the best available surfactants for even coverage on each grass blade for a natural look throughout the surface where Endurant is applied. There is no doubt among turfgrass professionals that Endurant turf colorants are of the highest available quality. That high quality however does not come at too high a cost. Endurant turf colorants provide a savings in water, fertilizer, seed and harsh chemical usage. Because Endurant comes in such high concentrations of organic pigments, Endurant provides the best value for the most efficient applications. The long lasting binders and even-coverage provided by surfactants also provide value by making Endurant long lasting and even without having to apply more product. 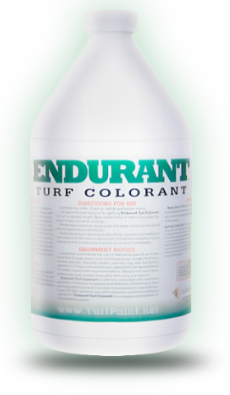 Choose your favorite shade of Endurant turf colorant and buy here.